Romano, known on this blog as Bachelor #1, was from the “cheese” litter. Born in 2003, I decided to name this family of eleven Alaskan Huskies after one of my favorite foods. Romano’s siblings were: Nacho, Colby, Cheddar, Jack, Gouda, Muenster, Tillamook, Whiz, Goat, and Stinky. This entire string of cheese was a joy to train, run, and race. I called them my hippie huskies — a completely laid-back bunch, they tail-wagged their way down rough trails and through many a Big Sky blizzard. When it came time for me to take a break from the 24/7 mushing lifestyle, I was fortunate to find the perfect new musher-parents for Whiz, Romano, and Stinky. Kristi and Dwight Gilliland of Billings, Montana, adopted them in 2007, often referring to the trio as The Cheese Brothers. Looking out the window right now, I’m reminded of how often life loops back around on itself. Romano, now 11 years old, knows it’s going to be a hot afternoon. Lolo is lounging on her couch (a round, waterproof Cabelas dog bed that cost more than the 1970’s davenport I’m sitting on now), watching her cheese man excavate a trench big enough for two under the shade of the lilacs. Later on today, I will glance out the window and, most likely, discover them both stretched out like lazy lions in the cool dirt, dozing with their tail-ends touching. But just two weeks ago, I was prepared to return Romano to Kristi. Bachelor #1’s presence was doing exactly what I hoped it would — making my lonely, heart-broken Lolo happy again — but there were other “issues.” Taking a sled dog from a larger kennel where he feels secure and part of a pack and moving him to an unfamiliar place is like escorting Crocodile Dundee through New York City. 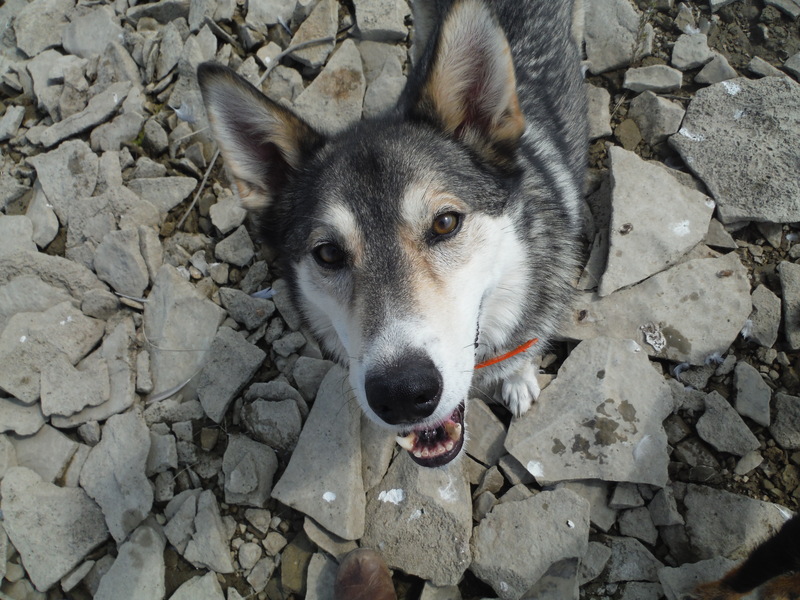 Romano had the perfect sled dog life as part of Kristi and Dwight’s string, and without his Cheese Brothers and the rest of their team, he feels vulnerable. Common things startle him. Strange people and noises — a flag flapping in the wind, children giggling, hip hop thumping from a car stereo — send him into a panic. But I also knew the fix wasn’t as simple as returning Romano to his pack. Originally, Kristi thought Stinky would be the best match for the grieving Lolo and my mobile lifestyle. But sadly I never got the chance to try him out — a week before I was to pick him up, he started limping around the kennel. A soft muscle tumor was found on his back leg, and Kristi, knowing it was right to end his pain, was forced to put her sweet Stinky to sleep. Visiting with Romano at the Gilliland’s home, I was thrilled to discover he’s still the same hippie husky I knew and loved 7 years earlier. But when I took him and my string for their first walk together in public at Livingston’s Sacajewea Park, Romano suffered a mental melt-down. Walking along a narrow dirt path sandwiched between a road and a steep, wooded bank dropping down into the Yellowstone River, Romano started off with typical sled dog enthusiasm, driving forward until he hit the end of my extendo-leash, and then leaning hard into his harness and dragging me down the trail like we were headed to Nome. I was thrilled to see my group settle into a natural line-up: Romano leading the way, Chloe staying right at his heels, Jigs trotting along like he’s competing for Best-of-Show at Westminster, followed by the keeper-of-the-kibble (me), and then, finally, Lolo (my 2004 Iditarod LEAD DOG… she declared retirement years ago). “Why does he think that?” Romano’s purple predator asked me, but I didn’t have time to answer. By this point, Romano had already leaped down the hill, disappearing into the heavy brush along the Yellowstone River. My mind raced, imagining Romano dead on the road, or disappearing into the heart of a strange town, never to be found again. He doesn’t even know me, I thought, thinking of the 7-year lapse in our relationship. It’s a natural instinct to want to chase a dog who’s running away from you, but I decided right at that moment I just needed to STOP. It was a difficult thing to make myself do, but I kneeled down in the middle of the path. My other three dogs, confused by my strange behavior, were thrilled to have me at eye level, and they danced and circled around me until I was hog-tied by three 18-foot leads. I sat there and waited for what seemed like forever, my eyes locked on the empty trail ahead. And then… finally… Romano popped his head out of the tall weeds. He looked up the trail and saw no one. And then he looked back down the trail and saw me parked there, bound and practically gagged by the rest of my string. Lifting his head high, his expression lit up with recognition. He bounded towards us at full speed, slamming his 66-lb. body straight into the middle of the pack. I felt miserable making the decision to send Romano back. I knew he loved our hikes in the mountains. And he lives for daily car rides in the Rav just like my beloved Borage once did. Lolo and him were working out as companions, even sleeping together in the same Dogloo at night. And to my amazement, even Jigs seemed to enjoy his company. I was prepared for the usual fights over food and deer legs and my attention, and they never happened. Yet still, knowing how much I travel, Romano’s fear of the big new world seemed like a deal-breaker. I didn’t want to torture the old man. The day after I decided to send Romano back to Kristi’s kennel, I took him and the rest of my string out to the Martinsdale Reservoir. On a whim, I decided to let him run free for the first time ever (on purpose). Much to my surprise, I unclipped his leash and he stayed right with me, trotting a few yards ahead but then turning around to make sure I was still there. My heart sank even lower. How can I return such sweet dog? The next day I went to Livingston to shop, and I stopped at Sacajewea Park to take the dogs on a quick walk-about. Something came over me, and I decided to let Romano go loose. Walk yourself… I told him as I released him from the back of the Rav. He paused and looked straight at me before he jumped out of the car, and then he trotted off down the trail, leading the string towards our favorite spot — an active osprey nest along the Yellowstone River. Moving so easily down the busy path, it took me minutes to realize what was happening. Romano was watching everything — bikers on the road, hikers on the trail, rafters in the river — but he wasn’t freaking out. Processing it all at a comfortable distance and his own pace, I witnessed him growing braver by the moment. A few days later out on the Martinsdale reservoir, Romano stood on the rocky beach and stared at a fishing boat. With his head held high and his pointy ears pricked forward, he examined the bizarre object trolling across the lake; he listened to the voices of the boat’s occupants, the muffled laughter carrying so far across the water. I sat down next to him on a smooth slab of stone and waited. After 10 long minutes, Romano finally turned his attention from the curious object and looked straight in my eyes. “That’s a boat…” I told him. He pushed his big head into my lap and wagged his tail. And then he turned away from me, loping off to catch up with the rest of my string — with the rest of his string. What a nice story. You enlighten me even on the most challenging days. Just when you think you’ve got a dog figured out, they’ll fool you yet again. Delighted this is working out, but I’m a sucker for a happy ending. Nice story.